Villa Kanedolo is a beautifully renovated stone house from 1884, situated in an idyllic setting, overlooking the vineyards and the forest of Momjan, a medieval town known for the sweet wine Muscat. 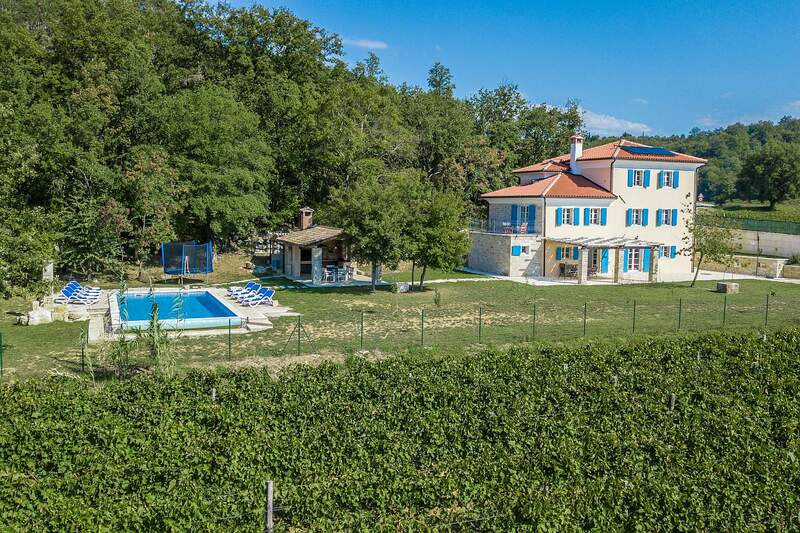 The house lies near the road leading to Momjan, with little traffic, and has a large and enclosed property of 1800 sqm where guests have an outdoor swimming pool of 50 sqm, covered terrace with large dining table and barbecue, trampoline, basketball hoop and five parking spaces available. Holiday home of 228 sqm on three air-conditioned floors. On the ground floor there is a living room with dining room, equipped kitchen, separate toilet and a pantry. On the first floor, there are two double bedrooms, one of which with private terrace and private bath/toilet, a shower/toilet is in the hall. On the second floor there are two double bedrooms and a shower/toilet in the hall.